Welcome to the home page for the Dog Training and Counseling Service, founded in 1975 by Laurie Fass. With over 30 years of professional experience, Laurie has helped thousands of dogs and dog owners. She has successfully solved problems ranging from simple to potentially dangerous. Her training methods are varied to suit the needs of each individual dog and situation. Her philosophy is the best solution to your dogs problems and training needs is the one that works. When training works dogs and people are both happy! Laurie’s services include private lessons and group classes in West Hartford, Windsor, and New Britain. You may also arrange to have her do most of the training for you, or schedule phone consultations if you are out of the area. 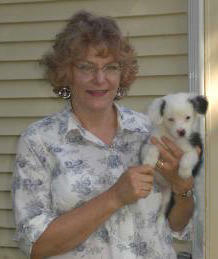 Laurie provides hands on help for dog owners throughout Connecticut and parts of Massachusetts. You may call Laurie to find out what services would best suit your needs. Laurie is featured on 1080 AM WTIC’s Pet Talk and can be heard on Saturdays from 2-3PM. Callers can ask any questions regarding their pets behavior (for both dogs and cats). Click here for more information on Pet Talk.